Thammasat University began in 1934 as an open university called the University of Moral Science this was two years after the so-called Siamese revolution of 1932 and eighteen years after the founding of Chulalongkorn University. Thammasat University was the idea of Pridi Banomyong, architect of the 1932 coup and the then Minister of Interior, who drafted the Act of University of Moral and Political Science 1934. The university was inaugurated on 27 June 1934, and Pridi served as the university’s first rector. The university is based on the sixth principle of the Khana Ratsadon. The first announcement of Khana Ratsadon stated the government “must provide the people with full education” because people “lack education, which is reserved for royals”. The desire of students at the School of Law to be upgraded to a university rather than simply a department at Chulalongkorn University also helped Thammasat University become the successor of the Law School. The property and faculty of the Law School were transferred to University of Moral and Political Science, and the building of the old Law School was the first Thammasat site. 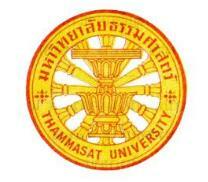 The university moved to Tha Phrachan campus the following year. When the university opened, 7094 people applied for admission. At that time Chulalongkorn University was graduating only 68 students a year. Thammasat initially offered a bachelor’s degree with an emphasis on legal studies and previously banned economics and political science, plus a bachelor’s degree equivalent diploma in accountancy. Master’s degree courses soon followed in law, political science, and economics, and doctoral degree courses in law, political science, economics, and diplomacy. During its early years, the university did not rely on government funding, but instead relied on its low tuition fees and interest paid by the Bank of Asia for Industry and Commerce, in which the university owned 80 percent of the shares. Under Pridi’s leadership, the University became the clandestine headquarter of the Free Thai anti-Japanese underground during the Second World War. Ironically, the University campus also functioned as an interment camp for Allied civilians, with Thai guards more or less protecting them from abuses by the occupying Japanese. The internment camp was where the Multipurpose Building now stands. Rangsit Centre is the second campus and the largest campus of Thammasat University. It is located in Amphoe Khlong Luang, Pathum Thani Province, 42 km north of Bangkok, and is easily accessible to Tha Phrachan by shuttle buses operating on direct high-speed expressway. Realising the impact of science and technology on the country’s economic growth, Thammasat University instituted degree programmes in engineering, technologies, physical sciences, and medicine at its Rangsit Centre in the 1980s and 1990s. Although established only for the science and technology-related faculties, all Bachelor’s degrees have been taught here since 2006. All faculties (except the College of Innovation, the College of Interdisciplinary Studies and the Pridi Banomyong International College) are at the Center. The campus also houses the Sirindhorn International Institute of Technology, an international academic institute attached to Thammasat which emphasises engineering and technological research and education. International programmes in Engineering, Health Science, and Journalism held by faculties are also taught at Rangsit Centre. The Thailand Science Park (National Research Centre) and the Asian Institute of Technology are also located here. The campus divided into three areas: the academic zone, the housing zone (dormitories), and various sport facilities. The Thammasat University Sport Centre, located on the Rangsit campus, was used in the 1998 Asian Games and in the 2007 Summer Universiade. The campus is easily accessible by public buses and shuttle buses going to the Victory Monument, Mor Chit BTS station and Tha Prachan campus. Post office, police station, banks, canteens, stores are all in the campus.